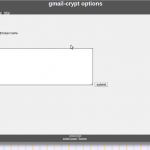 I’m proud to introduce gmail-Crypt, my new project bringing OpenPGP to Gmail and Chrome via an extension. The project is Open Source, under a couple of different licenses because of the code coming from various sources. In my experience, most of the existing options for OpenPGP/GPG/PGP are archaic and do not work well with how people use computers today. I think that we can create a simple experience with tight integration in the browser that can make encryption much more accessible. The project is in very early stages right now, and the current version is definitely an alpha. However, I wanted to put a version out there. Please note that this is still being developed and may not yet be suitable for your super secret needs, as noted in the license there is NO WARRANTY of any sort associated with this software. Click here to add the extension to chrome. It will ask you for permissions. Add keys for your friends (or your own public key) in the “friends keys” section of the options page. 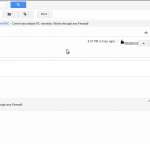 Go to your gmail inbox. Compose an email to someone who’s key you’ve added. 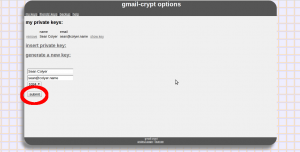 Click on the “encrypt me” in the upper right. *Note there is currently an issue where sometimes this will not display, try refreshing the page if this is the case. If you receive an encrypted message, click on the “decrypt me” in the upper right of the page. Step 2 – Message has been encrypted. Send. 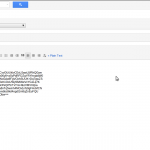 Step 3 – Receive an encrypted Message. Click “decrypt me”. 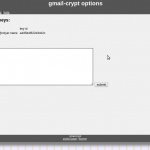 You can send me encrypted mail if you want to test it out. sean @ colyer . name. By combining the work by Herbert Hanewinkel and Tom Wu, we are able to create a powerful library. Both of these libraries had to be modified to work together, and the OpenPGP code was mostly re-written to provide a more object oriented approach and some code simplifying that I believe will make the project easier to build on. The project takes advantage of the “walled garden” approach to extensions. 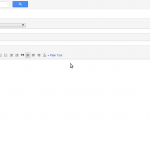 Through the use of a content script, there are changes made on the gmail page, which also interacts with a background page that serves as the middleman between the extension backend and the gmail front end. 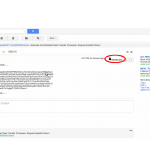 This is necessary because we want to store key information in the context of the extension, and this allows a certain level of protection between the gmail page and the key details in the extension. Google provides a good overview of this architecture. There is a lot of work still to do. Things I’d like to accomplish include: Key creation, key signing, find a good draft uploading solution, further integration with the browser, bugfixes. Check out the latest source for most recent details. I would love help, head on over to the project page if you can help out! These weren’t good for me. System Restore is never ideal, it’s just rolling back to before you made some unknown mistake, and you’ll probably lose stuff on the way. Explorer was running and userinit.exe was running. I was also tipped off that this was an issue with a local user profile because I had another user account that was loading fine. I didn’t want to create a new user and import data because there are lots of settings and things attached to this account, it also just seems like a messy way to fix this. The way I fixed this was to export HKCU/Software/Microsoft/Windows/CurrentVersion/Explorer from a clean profile. Log back in to your original profile. You have to delete HKCU/Software/Microsoft/Windows/CurrentVersion/Explorer in your registry; As far as I can tell you can’t edit these values regardless of permissions, but it will let you delete the whole directory (Nice one MS). Then import the version you exported previously, log out and log back in. You will lose a few things — generally settings in Explorer (file preferences, themes, etc..) unfortunately. I didn’t really feel like chasing down specifically which values got corrupted in mine, but if you were to look within the Windows registry folder addressed above and fiddle it could probably be found without too much effort — I was fine with basically reseting my explorer profile. Hope this helps someone, if something I said is unclear feel free to ask for clarification. Snow Leopard, 7, and Ubuntu, Oh My! Being home from school for the break I took it upon myself to finally upgrade my macbook from Mac OS X 10.5 (Leopard) to OS X 10.6 (Snow Leopard) — intended to be a relatively trivial upgrade, I somehow managed to stumble the whole way through. This was the last of my 3 Operating Systems to be upgraded (XP -> 7, Ubuntu 9.04 -> 9.10). rsync -ahv –delete –exclude=/Downloads/ –size-only ~/ /Volumes/BACKUPDrive/username/ From the Terminal in your home directory. (Apple or Command key + Space to bring finder search type terminal in this window). Running the Snow Leopard disc yielded my major issue: My Mac disc showed a yellow triangle and wouldn’t let me use my mac drive for the upgrade. Following a note I had seen online, I used Disk Utility (on the booted SL dvd) to resize the partition — DOES NOT WORK WELL — it in fact seemed to mess up both of my other installs (win7 and ubuntu 9.10), uggghhh. Accepting the inevitable and having backups of my data, I decided to run with this, I took the opportunity to clean all of my installs. From here, I believe I made two mistakes. My first mistake was when I repartitioned my drive I created 3 partitions, one large one for OS X and 2 smaller ones for the others, but I didn’t format them, just left them as free space. For some reason I believe this messed up how the computer decided to boot from them, it was like the GPT/EFI support with MBR got somehow confused. sudo diskutil resizeVolume diskDRIVENUMBERsVOLUMENUMBER 80G “MS-DOS FAT32” “Linux” 15G “MS-DOS FAT32” “Windows” 15G This seems to be the best way to re-size. From here you should be able to continue installing your operating systems of choice. rEFIt is the best way to triple boot, it should be installed now if it hasn’t already been. My second mistake: the most important thing to note in Linux is to install GRUB to the Linux Partition rather than the MBR (default). In ubuntu, near the end of the install there is an advanced options tab which will allow you to install it in the local partition, you want to do this. If however, you are dumb and mess up like me, you have to fix this later, because windows and linux will fight and will result in only one being bootable. grub-install /dev/sdaPARTITIONNUMBER will install GRUB to your needed partition. dd is a very powerful and useful command, I ended up using it for several different things during this installation. dd provides relatively low level access to disk reading and writing functions. BE VERY CAREFUL TO GET PROPER if= AND of= ARGUMENTS. dd if=/whereveryouwant/DiskImage.iso of=/dev/disk2 bs=1m is a good way to make a USB drive boot an image. (use diskutil list to verify if=/dev/disk1 ). ***This will almost certainly wipe whatever is on the USB drive (/dev/disk2) so make sure you don’t need whatever is on there. Under OS X this is the best way I’ve found to make bootable USB flash drives. Avoiding redundant GRUB entries avoids refit from displaying phantom legacy OS boot options, or extra linux options. Installing windows will overwrite the MBR and you should be able to boot from any of your operating systems. If you do things as terribly out of order and with partitioning as I did that you need to reinstall windows, you might come across a windows upgrade issue. Windows 7 has a new way of verifying if you are using an upgrade DVD — rather than asking you to input an old CD or DVD, it will look on your system for pre-installed versions of windows. However, having just formatted everything this is an issue. Solutions: 1) Reinstall XP/Vista (NOT IDEAL). 2) Plug in external or other hard drive with XP/Vista Install (NOT IDEAL). 3) Install Windows 7, make it through the install to where it asks for your key. If you put in your key (and you’re sure it’s correct) and it says “key is not valid” (Note: this is in the initial key entering, not activating), then you seem to have no way forward. However, if you reboot and relaunch the installer, Windows seems to detect the install you just created as a valid install, which will let you input your key the second time without harassing you. rEFIt has a partition tool. This is a way to use gptsync, and this is very useful. There were a few situations I needed it in, sometimes you have to help the computer sync MBR/GPT. It will basically auto correct differences in the table that it detects. gparted is a useful linux tool for partition management. I needed this for a few small things and it can help point to where your issues are. There is a live image or you can find it on most live distributions (ubuntu). To answer why, after all this I triple boot rather than virtualize… I’m running an old 32-bit Core Duo macbook — I don’t believe they have the Intel Virtualization Technology. More importantly, I use Ubuntu generally for certain low level tasks (i.e. Wifi card in promiscuous mode). I use Windows for (limited) gaming/weird hardware access and most of the solutions that port graphics don’t support my chip (VMWare Fuzion). I’m sure this process ended up being far more painful for me than it needed to be, but I’m back to happily triple booting.